Caption slip reads: "Photographer: Gaze. Date: 1952-03-28. Reporter: Santley. Assignment: Santa Monica mystery death. Detective Inspector Lloyd Hilaiel inspects auto in which body of beautiful brunet Mrs. Dorothy Higgins Preston, 32, lies. Copy -- photo Mrs. Dorothy Higgins Preston. 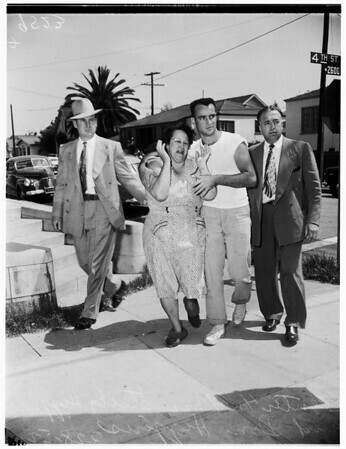 Don Higgins leads his mother, Mrs. Stella Higgins, sister-in-law of victim, from scene after her collapse". Edits: "Stella, Stella".